The first thing George began doing this morning was to start to edit the videos that Little iPhone captured yesterday. Those videos were mostly of the Lower Yellowstone Falls. Baby Boid was shaking his head while looking at George. "Why are you shaking your head? ", asked George. "You seem to forever do things in the wrong order", answered Boid. "Whatta you mean? ", questioned George. Baby Boid paused for a few seconds and then answered, "It's gonna take you quite a while to figure out about editing videos. How about you first getting dressed, giving me my bird food and then making yourself some breakfast?" 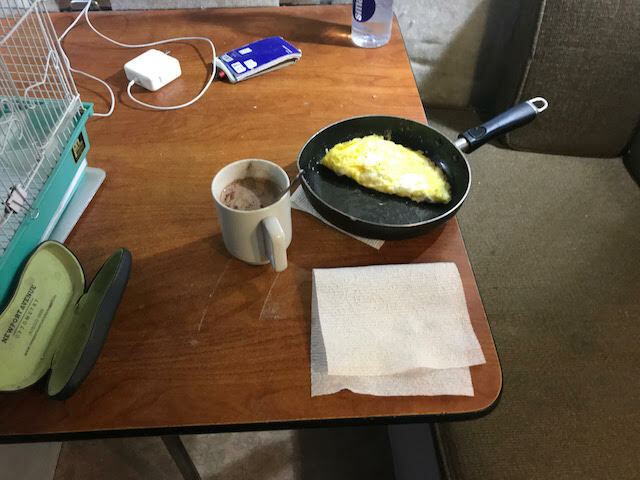 As George began doing the Blog, he noticed that Mac's battery was low, and went to charge it up using the 120 volt AC power from the inverter. But the power LED in the inverter began flickering! It seemed that the 12 volt DC connection to the inverter was not working correctly. Was the connection loose? 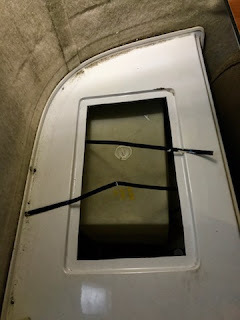 In order to check out that connection, the Bravo inverter had to be first removed from Scampy's wall so that the bottom of the inverter could be examined. When George first installed the Bravo Inverter in 2016, he used construction wire which is very stiff. Bad idea! Stiff wire like that works the connection due to vibration when Scampy is traveling. It is now necessary to change from stiff construction wire to regular electric wire which is flexible. 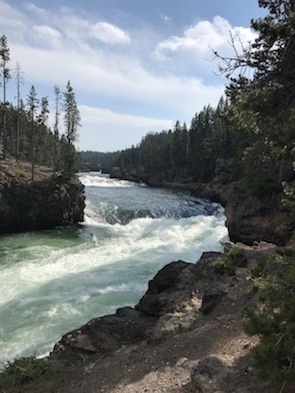 The Brink of Upper Yellowstone Falls. This morning when checking the water level in Scampy's freshwater tank, it was noticed that the second strap tie-down had broken. When the first strap broke the tank was still secure. With the 2nd strap now broken, we must attend to tying down the tank this morning. Note: Overfilling the fresh water tank caused spillage. That spillage led to rusting out the steel straps. We now control overfilling. 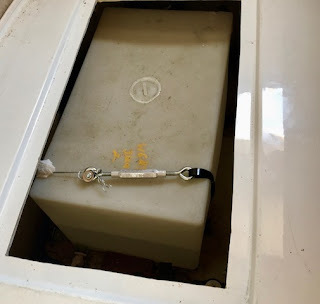 We went to the hardware store for a turnbuckle to secure the loose tank. Freshwater tank securely locked down. As odd as it may appear to be, Tioga George who hardly ever makes his camps in a campground, made his Nite Camp in Cabin Creek Campground. Pretty inexpensive too! With the Senior Pass, only $3.50 for a nice wooded site. Doesn't make sense 🙈 you fill up the water tank, when the tank is full of water flows out the overflow pipe on the of the trailer. That's the way it supposed to work . You are having quite a day! Especially if this comment of yours is any judge! 1. You are commenting that I am now traveling with two trailers? I'm only traveling with Miss Scampy. 2. You write that: "....you fill up the water tank, when the tank is full of water flows out the overflow pipe on the of the trailer." This is not happening. 3. You ask: "How do you get fresh water inside, it's not supposed to be there?" 4. 611 does work. 611 connects to a T-Mobile robot. The filler neck is outside the trailer. And the overflow vent is also outside the trailer. So the question is, where does the spillage come from? About a year ago, the filler and over flow tubes began to leak. In order to get at them, it was necessary to remove the fiberglass bench seat. I was not able to re-attach the filler tube properly because I had to trim the filler tube end in order to have a good section of tube to get a hose clamp around. I should have ordered a length of that tubing from Scamp Trailer to do the repair properly. But I made do. I have a question for you, Ed. How in the world are you aware about the "filler neck" and the "overflow vent"? Baby Boid agrees with you. Boid says, "Im likely the smartest birdie in these-them parts!"